Details relating to the Latvian Commemorative of 2014. 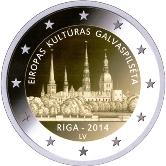 The coin honours Latvia’s capital Riga the won the title “European Cultural Capital” for 2014. The motif shown in the inner circle is of the skyline of Riga and the historical city centre. Depicted are, from left to right: St. John's Church, St. James's Cathedral, Three-Stars-Tower of Riga Castle, St. Peter's Church and Riga Cathedral. Around the edge of the inner circle is the inscription :”EIROPAS KULTURAS GALVASPILSETA” (European Capital of Culture). At the bottom of the inner circle is “RIGA – 2014” and immediately thereunder the country designation “LV”. Return from Latvian Commemorative 2014 to euro coin collector.